Peeved Mommy Syndrome (that's right...PMS) - Stop staring and start sewing! Okay, so photobucket pulled my cutie toddler photo in the last post (still waiting for an answer to my "what the heck?" email) and so I figure I'll just use flickr. The next day I see that flickr has pulled it too. Dangit! So I finally got smart and hosted it myself. What am I missing here? Is a toddler without a shirt on considered offensive (because that's how we roll here!)? Is it the zebra print (no animals were harmed in the making of that fabric, honest)? I finally had a chance to play with the Flower Power fabric. I haven't had much sewing time lately so it was a nice treat. 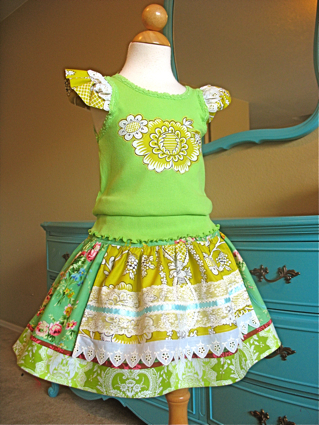 Here's a cute little outfit using my Evelyn Apron Skirt pattern. I shortened the apron a little to accommodate the eyelet lace at the bottom. 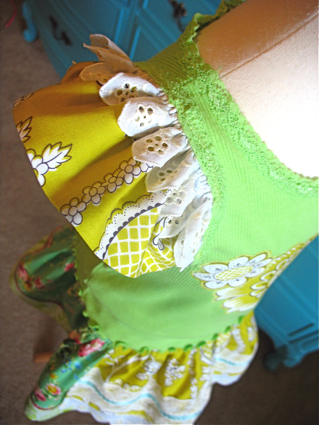 I tried something new on the sleeve ruffles and added a layer of the eyelet lace to it. I think it's cute but makes it a little top-heavy so I think I'll try it with a much lighter lace if I do it again. I finally got a birthday present together for my niece who turned 15 this past Saturday. I think the Andalucia fabric by Patty Young is the perfect fabric (not baby-ish but definitely feminine and hip). Actually, this is how lame I am (although I refuse to take all the blame because she does have an uncle here too and he knows the way to the store)...the banner is for her birthday, the apron is a late Christmas present, and (it gets worse) I'm including the gift card I bought in December for her birthday last year. I always get around to it, it's just a matter of when. 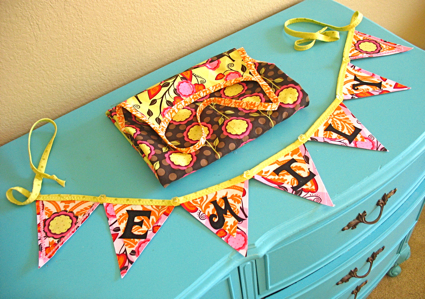 If you want instructions on how to make the banner you'll have to get the Sew Simple magazine next month. I think it's supposed to hit the stands on April 21st and it has my banner tutorial in it. I'm trying to stay cool about it but to be honest I'm totally thrilled and I'll admit it...if my project is on the cover I'm going to freak out in the middle of Barnes and Noble. It's true. But either way, I'm cool. Cool as a cucumber. A sad, sniffly cucumber who didn't make the cover. 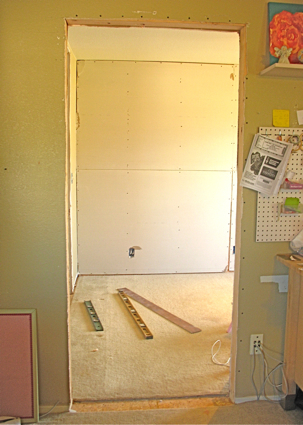 Oh, and here's the office view from my desk (before picture here). All we have to do now is the taping and texturing and then I get to paint. Woohoo! I'm thinking a golden yellow color since it's not a big space and I want it to glow. I can't wait to move in! Right now it's serving as a t.v. room for two sick boys (I'll probably need to Lysol it first, eh?). Have a great week!! Oh and run over to The Fabric Shopper blog because I'm joining Melanie in having a great give-away!